Last week my friend Ai was visiting, and for the weekend we decided to travel to the lovely city of Bremen. We spent the day walking around the old town square, visiting the churches and discovered Schnoorviertel. This is the oldest quarter of the city filled with tiny cottages dating back to the 15th century. We stopped for iced tea’s in the most inviting tea house and got carried away with smelling every flavor they had on display and I couldn’t help myself from purchased the most wonderful smelling Chai Tea. 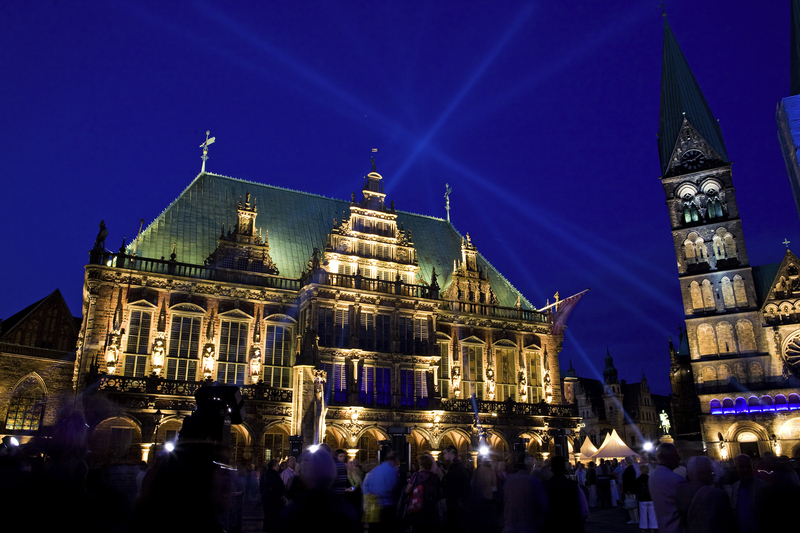 In the evening Bremen Music Festival started, so the town hall, churches, music hall and surrounding building in the square were lit up with spotlights with the church bells ringing! It was truly a memorizing moment! And thanks to this photo provided by Nikolai Wolff you can experience what it was like! Click on the photo to see the full screen shot. While walking around Bremen and Hamburg, the one thing that Ai kept commenting on was how she loved the German bakeries. Each bakery had their own assortment of cinnamon, buttery pastries overflowing with custard or fruit jelly fillings. So on her last night we made a raw version based on her favorite pastry, these Cinnamon Blueberry Törtchen (“small tarts” in German). I packed up a few for her to take on her flight home and the rest I have enjoying with a warm cup of my new Chai Tea! First process the dates in the food processor, then add the rest of the ingredients. Add a tbls of water if the mixture is too dry. Using a tbls measuring spoon, spoon in 1 tbls of Cinnamon Pastry into each hole of a small cupcake tray. Mold with your fingers into small tart shapes. Blend all the ingredients until smooth. 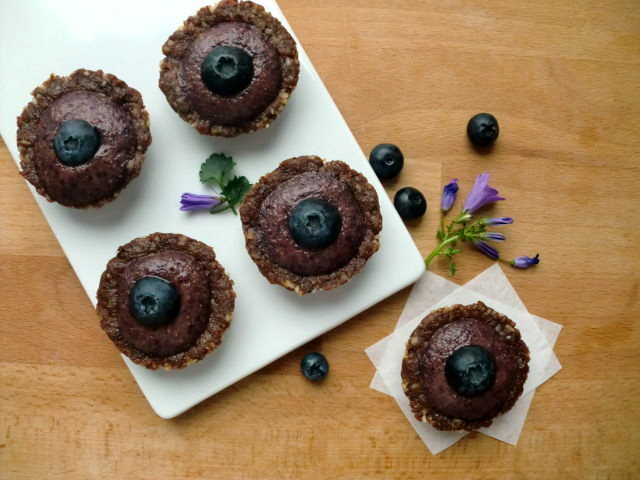 Spoon the jelly into each tart and top with an additional blueberry. This entry was posted on August 27, 2010 by Olive. It was filed under Uncategorized . Beautiful creations…your tarts and the architecture of the building….glorious! I love chai tea! Have a wonderful day! Wow, these look amazing! You always impress me with your creations! Wow, how cool is that photo and you girls were there…looks like a fun night. Yes Ai is home and I can see all the German pastries she ate…thank God and Carla for raw versions of the favorites…these look good Carla…can’t wait to try them. Love these small tarts! The perfect size. mmmm. These look Delicious! I’m getting ready to make them and can’t wait to try ’em out.